The Brazilian navy says it has recovered the bodies of two of its members from the debris of a Brazilian research station in the Antarctic. 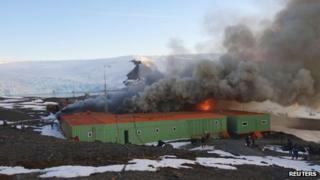 The Comandante Ferraz base near the tip of the Antarctic Peninsula was destroyed by an explosion on Saturday. Officials said the blast was caused by a fire which raged through the base, where marine research work is carried out. A third member of the navy injured in the fire is in a stable condition. Defence Minister Celso Amorim praised the military personnel's bravery. "In an act of heroism, they risked their lives to extinguish the fire, but did not succeed," Mr Amorim said. He said all the scientists from the station had been evacuated to Punto Arenas in Chile, from where they will be taken to Brazil on Sunday. The military personnel stayed in Antarctica, but sought temporary shelter at Chile's Eduardo Frei research base. Officials said the fire started in a machine room housing energy generators before destroying the entire station, which had been built in 1984. Fifty-nine people were stationed at the base on King George Island when the fire broke out on Saturday morning. The Comandante Ferraz base was equipped with research laboratories, dormitories, a large-scale kitchen, a library, and technical installation used by expedition boats. An investigation is under way to establish the cause of the blaze. Researchers said the burning down of the station was "an incalculable loss to science".